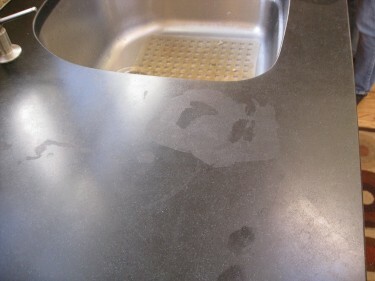 I have a light grey bleach stain on my honed absolute black granite kitchen counter standing out against a darker field. I've had some pros come in and give estimates. Two said it had to re-honed, as the surface has been etched by the " acid " ( sic ) and one said that it has to be stripped and re-sealed $$$. I called Stonetech and the tech help guy said that I need to strip the existing granite sealers and re apply the enhancer (which made the stone darker) and that the black granite will absolutely not etch from an alkali / bleach but an alkali will strip the sealer ...and that is what happened. He said that I could just continue stripping with bleach since it seem to work so well already ...I'm not sure if he was sort of joking but there is truth to that. I called the original fabricator / installer and they told me that they had used Stonetech Impregnator Pro at the shop and they also must have applied the enhancer after it was in place because I have photos of the install and I have photos of the stone as dull grey and as enhanced. Then, because we went away for a year and would rent, we applied a coat of Stonetech Professional sealer. Now I need to strip all of what has been applied. So the question is: Since I have a solvent based Impregnator Pro and an unknown based Enhancer and a water based granite sealer on there, what do I use to thoroughly strip the surface before re-applying the granite sealer / enhancer? Bleach is alkaline not acidic, but it will still etch acid sensitive stones like marble, travertine, slate. Honed absolute black granite, however, is not sensitive to acids and will not etch. So, I agree with the Stonetech rep... the bleach stripped or may even have etched (which can happen) the enhancer. Either way the effect would be the same. For sure if your honed Absolute Black granite is actually black, then a color enhancing granite sealer has been applied and the gray you are seeing in the bleach spot is the more natural color of the raw stone. I suggest you test strip an area right next to the bleach spot using acetone or you may have to use methylene chloride, which is a more potent solvent. this in the All About Sealing e-Book if you'd like more complete info. Reason is that if the bleach just etched the sealer, then it still needs to be stripped. Now the bleach may have actually stripped it, but the acetone should and the methylene chloride definitely will strip the sealers. So, test a spot with solvent, judge the results and determine how you should proceed... bleach or solvent. Definitely provide maximum ventilation and take care when working with either. I'd say the bleach presents more immediate danger though, especially if you aren't diluting it much. You could get chlorine poisoning pretty quick. None of this will be fun, so be prepared for a project, protect your cabinets, etc. Once stripped, you you will probably want to apply an enhancer-sealer again to keep finger prints, etc. from being so noticeable, but you probably won't need to also apply a straight impregnating granite sealer. Absolute black granite is very dense and not very absorbent even when honed. Go ahead and do the water test for sealing granite countertops to see how absorbent it is. Since sealers have been applied I'm going to assume that indeed your granite can take a sealer (meaning it will absorb without problems), but it's always best to test first. Sealer compatibility can be an issue when re-sealing and applying a new sealer over a previously applied sealer. Generally it is best to stick with the same granite sealer when/if re-sealing a countertop. Using a different brand or different type (water vs. solvent-based) can lead to absorption and adherence problems even after stripping. Of course, you may have no clue what was previously applied or if even if you do, you may not know for sure if the new sealer will be compatible. Best to know about all this of course, so it is also covered in the above referenced e-book as well. Common general advice is that most granite countertops "need" sealing every 3-5 years. But this is a BIG generality since many granite varieties do not need sealing at all. And for those that do need it there is no way to guess or know without testing how many coats any particular granite may need or when it needs re-sealing. Could be 3-5 years, but could be 1 or 8 years depending on several variables detailed on the granite sealer guide page. So, after stripping the sealers water test first. Likely the test will show that a granite sealer can be applied. Probably only one coat of a color-enhancer is needed. Test after the firs coat to see if a second can be applied. An impregnating sealer is almost certainly not needed over the enhancer. If you try all the above without satisfactory results, then I'd suggest your best move at that point is to hire a stone restoration pro to re-hone the granite countertop. Have not used these, but good idea to start. Just do a test area first to check results are satisfactory. Brian , thanks for the input . I'd like to try some of the less toxic strippers . Have you had any experience with Citristrip , Safest Stripper or Soy Green on sealers ?